It is far from easy to strengthen resilience in places where environmental and climate-related risks also interact with pre-existing social, economic, and political stresses, such as poor governance, chronic food insecurity, entrenched grievances, and instability. How we go about adapting to climate change is critical to ensuring we contribute to more sustainable and resilient communities – rather than exacerbate existing problems and create more trouble in already-fragile contexts. In new research drawing on International Alert’s extensive history of fieldwork in Nepal, we found several examples ill-informed interventions and siloed approaches to climate change adaptation creating negative consequences. Still recovering from a decade of conflict, Nepal is well-suited to analyze the complexity of building resilience in very poor and fragile contexts. As one of the most vulnerable countries to climate change in the world, Nepal receives a fair amount of international adaptation funding – $113 million approved so far, according to the Climate Funds Update, fourth highest in the world. This small South Asian country, which encompasses Himalayan peaks, highlands, and the Terai lowlands, also receives wider humanitarian and development aid to the tune of roughly one third of government spending. Climate change has brought recurrent floods, droughts, cyclonic storms, landslides, and glacial lake outburst floods. In the meantime, some of the factors that led to civil war from 1996 to 2006 remain present, such as high unemployment, extreme poverty, rural-urban inequality, corruption, ethnic tensions, and distrust of the central government. Our research found that climate adaptation programs that ignore this social and political context could be even worse than no adaptation at all. This is not to say that aid is useless or no longer needed. On the contrary, in fragile and vulnerable states facing the dual threat of climate change and insecurity, effective and well-targeted aid can play a key role in building resilience and shielding vulnerable households and communities from acute humanitarian crises. This research merely makes the point that the availability, distribution, and adequacy of foreign aid is important not only for immediate relief, but long-term recovery and sustainable peace as well. One example is from the dry and hilly district of Rolpa. Interventions led by the international humanitarian community have started promoting a shift from cultivating rice to less water-intensive crops in order to adapt to changing rainfall patterns and temperatures. In their place, some farmers have started to grow high-value cash crops, such as bananas and oranges. But some respondents noted this is possible only for wealthier farmers who own their own land and is not an option for poorer tenant farmers. In addition, these cash crops require fewer agricultural laborers, further reducing income generating opportunities for poorer people. As a result, some farmers saw these interventions as reinforcing inequality and ratcheting up related tensions. Access to climate aid can be become a source of conflict in and of itself. The marginalization of the poor and certain ethnic groups was a root cause of Nepal’s civil conflict, and Rolpa, one of the most vulnerable of the three districts we investigated, is widely perceived to be where the civil war emanated. Based on extensive interviews and observations, we found a strong perception that climate aid is disproportionately flowing to less vulnerable districts, entrenching historic and present lines of marginalization and exclusion. In fragile contexts, where governance often suffers from lack of transparency and accountability, inappropriate climate interventions and funding can be diverted to satisfy political and economic elites, who give themselves privileged access to and control over resources and opportunities to strengthen their positions. Further, these interventions can be used as an excuse to stifle efforts by communities themselves to build resilience, further exacerbating social cleavages. To build real resilience, external actors have to drill down into the diverse components of vulnerability, to look beyond the hydro-meteorological impacts of climate change and consider their interactions with non-physical factors that are crucial to peace – namely governance and power, livelihoods and assets, justice and equity, safety and security. Policy responses should be tailored to the local context as much as possible to understand the interconnectedness of different risks and how they differ between individual, community, and national layers. Since the signing of the Comprehensive Peace Accord in 2006, Nepal has experienced periodic civil unrest and political instability. Despite good intentions, some climate interventions have unwittingly reinforced the inequitable status quo that contributed to that conflict, or worse, compounded entrenched grievances. Large inflows of international climate financing are now creating public expectations for better support (compensation for victims after a flood, for example). This represents a real opportunity to do things differently and build peace alongside climate resilience. Link the capital with local realities: Most policies and activities are planned and prioritized from Kathmandu, yet resilience to climate change and environmental risks is highly dependent on local-level context. Certainly, adaptation needs to be locally informed through bottom-up processes, but top-down leadership is also required. Stronger communication between the capital and local leaders in the provinces can ensure greater awareness and implementation of national plans and policies. Address failures of governance: Lack of accountable and transparent local governance has been identified by respondents as an impediment for building resilience. Ensuring an accountable and legitimate government is vital for peace. Interventions should bolster governance, not fuel corruption or bypass state systems and create a para-state system run by NGOs. Address unequal access to and control over resources: Issues of access to and control over resources are totally missing from national climate policies and plans. To build resilience, these policies need to address issues of fair land tenure, minimum wages, job security, and access to credit. Clémence Finaz is a research associate in and Janani Vivekananda is the head of the Environment, Climate Change, and Security team at International Alert. 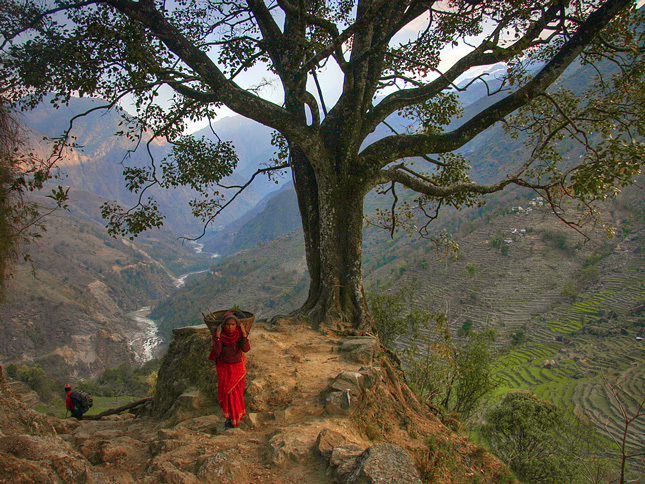 Photo Credit: A Nepalese porter, courtesy of flickr user Taylor Miles. I couldn’t agree more. But Nepal has just shifted, tectonically and socio-economically, from a rock to a hard place. Thus, it seems to me that there is no more appropriate time than now in which to contemplate the specific steps to be taken and to build back better a post-earthquake ravaged Nepal.